In a homage to Little Nellie scene, Bond removes the handlebars (that would not have looked out of place on a Chopper Bike) and the body from a large white bag, before you see him head off to Stromberg’s underwater lair to save the girl, as it were. 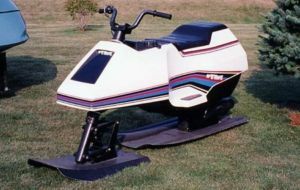 It is undoubtedly the first time the audience had ever seen anything like a Jet Ski before, because the Wet Bike was a prototype of the Spirit Marine vehicle that would be launched the year after the movie’s release. It was powered by a Suzuki engine and a pump jet and really worked, unlike some of the whizz bang gizmos. The Wet Bike remained a market leading craft until the mid 1980s when the Personal Water Craft because they were considered easier to handle. The last Wet Bike was produced in 1992. The Personal Water Craft or Water Scooter - the trademark Jet Ski, is a more commonly referred to moniker. A bit like people call Vacuum Cleaners; Hoovers. A bit of a hunt around and we managed to find an excellent condition example of the 1978 Wet Bike 007 used in The Spy Who Loved Me. It was listed in March 2013, and if it is still available our UK readers will have to add the export costs from Canada to the $1,500 asking price.